They delivered the papers, until they made the headlines… Newsies, the smash-hit, crowd-pleasing musical from Disney is now playing at Sherwood Center for the Arts. A two-time Tony Award®-winning show, Newsies has audiences and critics alike calling it “a musical worth singing about!” (The New York Times). Filled with one heart-pounding number after another, it’s a high-energy explosion of song and dance you don’t want to miss. 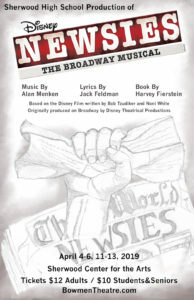 Now is the time to seize the day with Newsies, playing April 4-6 and 11-13, 2019 at 7:00pm at the Sherwood Center for the Arts in Sherwood (NOT at the Sherwood High School PAC). Run time for the show is 2 and a half hours including one intermission. Purchase tickets online or at the high school from Debi Bear. More information here. Get your tickets before they sell out! 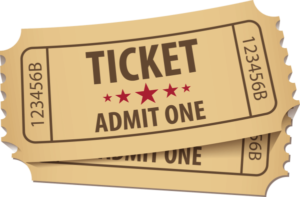 When purchasing tickets, if you aren’t asked to provide credit card information, your purchase is NOT final. You will receive an email confirming your purchase. If you have any difficulties, please contact us immediately.